This is the process I go through to pull up the walls of a pitcher. There is an excitement in the process of creating any thing that will sit on someones table. I hope you enjoy this. Let me know. The finished product, now all I have to do is pull a handle. This is a video showing how I begin the process of making a hand thrown bowl, first by centering the lump of clay, opening up the lump of clay, and finally raising the side walls up. I think you might find this interesting if you have not ever seen the process done. Let me know what you think. Thanks. 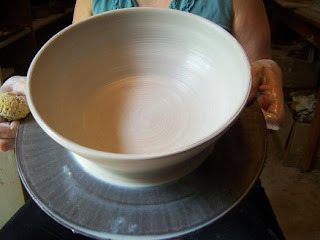 This is what the bowl looks like after I finish throwning it.. Now to the rack to dry. Then fire to 1800 degrees, then to the decorations, and glazing. Pottery Kids Tea Set Tutorial Attaching handles. I had to change the way I was use to throwing pottery since I had been making large bowls, and extra large cups. I decided to try throwing off the hump, which means you use a large lump of clay, and throw off the very center top. In this session I will give a tutorial on how to I make the cups. After the cup base is thrown on the wheel, the trimming part is next. 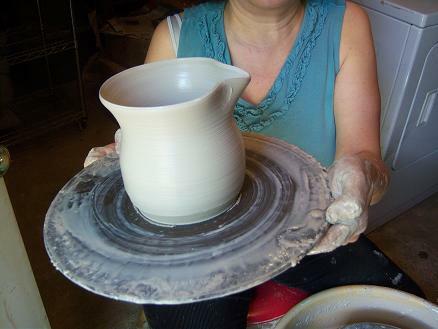 Wetting the wheel to create a bit of a suction between the wheel, and clay. Place a leather hard cup on the wheel till is sticks. Using a sharp tool begin to trim all the excess clay. Always hang on to the cup, I lost a few thinking that I had stuck them on secure, only to find it slipping out of my hand. This is the cup after it has been trimmed. Making the handles requires patience. Pulling clay with down ward motions, and a lots of water. The first time I tried to pull a handle I pulled to hard , and had thin, and thick places, or I would break off the handles. Allow to dry to leather stage, that means when you rub your finger against it, it doesn't tug across the clay. Allow cups, and handles to dry to leather stage, that is when finger is rubbed across it doesn't drag. Make sure the angles cut fit the angles of the cup. 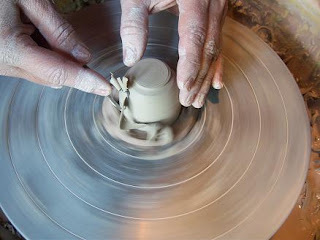 Add slip, which is watered down clay. I also use vinegar with the slip. Smear the cup with slip, and vinegar. Press the handle to the cup. Make sure you hold the inside of the cup as you press on the outside of the cup. 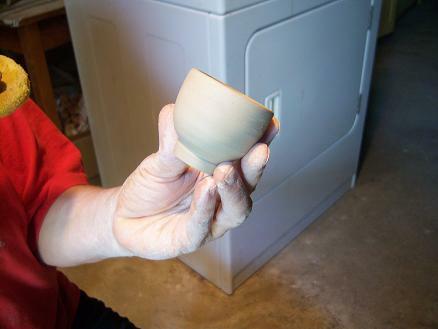 Using a paint brush , clean the outside of the cup of all marks of slip..
Go on an finish the rest. My little granddaughter Marisa, or Misa as she calls herself, is turning 3 on Monday, and I wanted to make her a special dress for her birthday.. I had always wanted to learn how to smock.. Then at painting class I saw my friend Carol working on a baby outfit with smocking. I was intrigued as the design came alive right before my eyes.This is my first attempt at making a smocked dress. This was the practice cloth my friend Carol smocked the top part. Right below is my attempt at smocking. Then after more instruction the bottom part with the string trailing was my second attempt. See the vast improvement? At least I saw it. Here is a mini course on how to do the most basic stitch the cable stitch. Smocking material has treads running horizontally about 1/4 inch apart. It has valleys and mountains. To start use colored embroidery floss. Floss comes with 6 strands, split into 2 treads. Tread needle with18 inch double strands of floss, tie knot at bottom. Insert needle through back side coming up in the ditch. Next to horizontal treads with out touching, the horizontal treads, those treads will be pulled out after smocking is complete. Go to the left pleat to anchor stitch. Then go to the right, just above running stitch line. Tighten stitch. Now for the next stitch notice the tread is going up. That is called an up cable, when the thread goes down , it's called a down cable. Notice in the next photo the up, and the down stitch. That's my mini course on the cable stitch, finish practicing across to the end of the material. The cable stitch is on the top, went on to do the baby wave, more cable, and hearts with the treble stitch. Fry peppers, and onions in a couple of tablespoons of olive oil. Fry 4 eggs scrambled style. To make flour tortillas from scratch is just a easy as using store bought ones. See my August blog on homemade tortillas for complete instructions. Layer scrambled eggs, cooked sausage, peppers, onions, and cheese on top of heated tortillas. Salsa if you prefer. Line up ingredients in the center of the tortilla. Fold bottom 1/4 of tortilla up. Fold right side of tortilla up over towards the middle. Keep rolling till the roll meets the end. 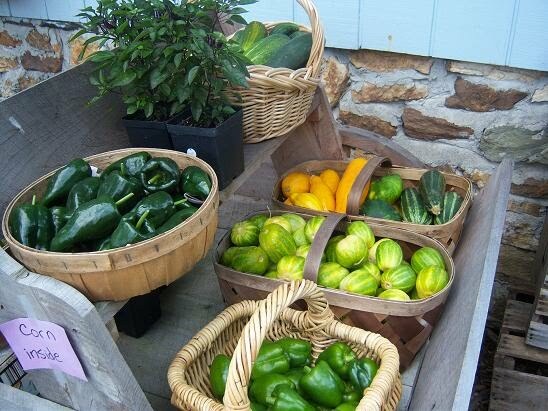 I try to buy locally grown food or products when possible. I adjust my menus accordingly. We have quite a few local farmers in Meadows of Dan, VA one of them being Sue Shelor of Mountain Meadows Farm and Craft Market. I spotted some beautiful poblano chili peppers, at her market, and decided to make my most favorite Mexican dish chile rellenos or stuffed pepper for the non Spanish speakers. This dish is a lot of work but oh so worth it. The first thing that has to be done is to peel the peppers. Place peppers under broiler in oven till the skins blacken turning them over every time one area blackens. Place blacken peppers in bowl place with doubled up towel covering them for 10 minutes which will loosen the skin. Meanwhile place frying pan drizzled with oil to cover the bottom, on stove to heat up on medium heat. Scramble the eggs in a bowl , dip floured peppers into egg mixture, and fry. Turning peppers once they puff up and are crispy. Place peppers on a towel to drain. After peppers are fried, cut all around top of pepper, remove seed bag. Fill peppers up with chicken mixture and cheese. Place in shallow baking dish, pouring the can of enchilada sauce over the peppers. Bake for 1 hour at 350 degrees. Spoon over Spanish rice, accompanied by refried beans. I have the recipe for Spanish rice recipe in Marches blog.